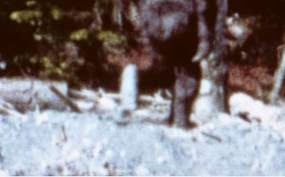 Editor's Note: This is a guest post by British Bigfoot researcher Thorn Stronger. He is the author of the Armchair Bigfooter Blog. I am largely of the opinion that the only piece of Bigfoot evidence worth spending any time on is the Patterson film. Or rather the film, related casts (alleged casts as I can safely call them at best having not been there when the tracks were left), and the actual film site itself. I am becoming less and less interested in the supposed character of Roger Patterson. I am also becoming less and less interested in the debates about supposed confessions from people involved in hoaxing the film. However, it is almost impossible to stay away from the latest debate regarding the film. I am unsure about the Freeman footage, but the Patterson film is gradually becoming firmly set in my mind as the real thing. 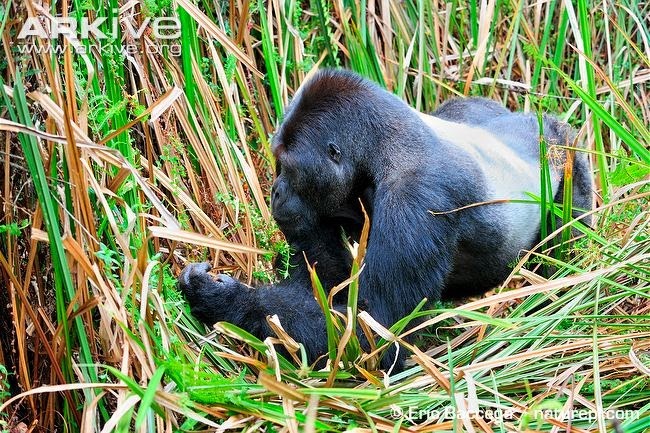 So, back to the gorillas. 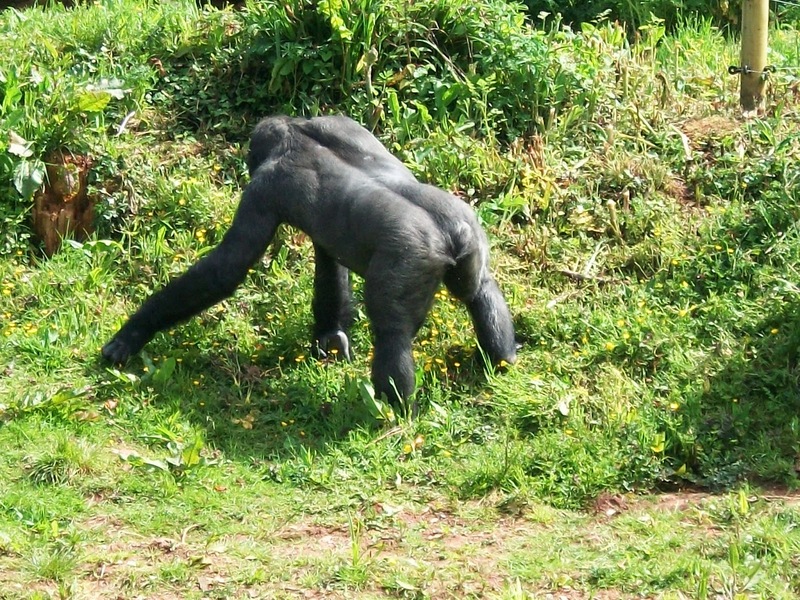 It was at Paignton zoo that I stood for hours watching the Gorillas. Upon entering their enclosure, one thing struck me. The smell. I can describe it best as a mixture of old piss and straw, and I drew immediate comparison to the supposed smell that precedes a Bigfoot sighting. I don’t recall any mention of a smell when Patty was filmed (in fact I’m sure I’ve heard Bob Gimlin say there was no noticeable smell) , but many witnesses say that the first thing they notice is a smell. Since I am looking to the Patterson film as the real deal, I can’t therefore say that there is a match here, but I think it is worth mentioning the smell. **Update: On reading “The Bigfoot Film Controversy” it appears that there was indeed a stench from Patty. 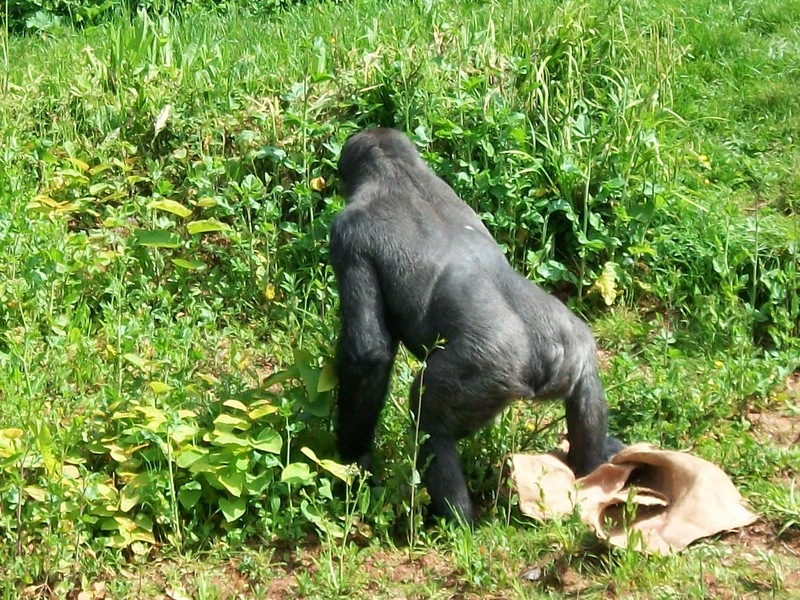 The rear view of Patty shows a certain musculature and physical anatomy that can be compared to the anatomy of the gorilla. I have read about this on other people’s blogs and in other people’s books but it wasn’t until I saw the gorilla that it struck me. Now, I’m not about to get out the red pen and start putting circles around everything because frankly, I’m also tired of seeing that all over the internet too, but note if you will the line of hair down the gorilla’s back, the ‘love handles’ below the latissimus dorsi muscle and the shape of the head and shoulders. In the second picture please also make note of the large shoulder blade. Take a look at the Patty gif below and note the shape of the head and shoulders, and the line of hair down the back. If you go back to the video and skip to 1:15, you will also note apparent “love handles” on Patty. 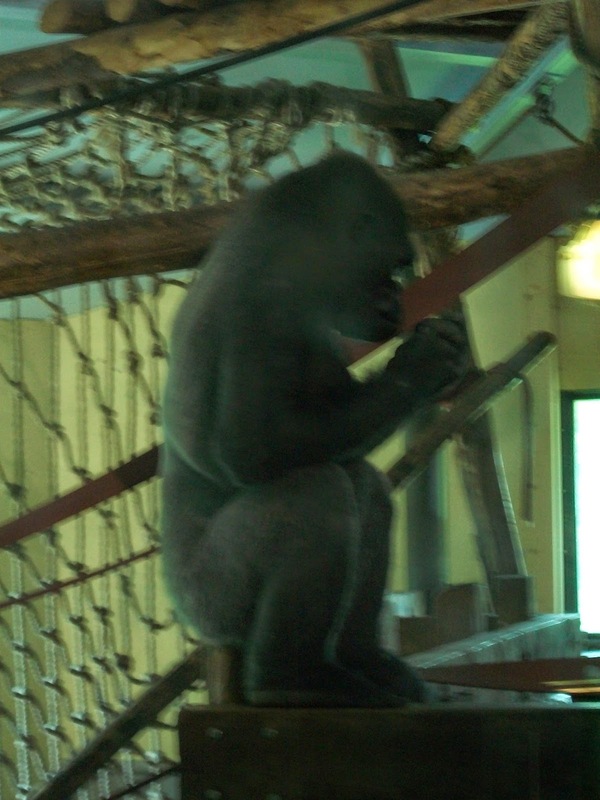 I also noticed that the hair on the gorilla looked a little patchy, like there were bits missing, or bits that were darker than others, the photos I took don’t really do it justice, but again if you go to the video you’ll note that the hair looks kind of patchy in places. Also you will note the sleeker, seemingly lighter hair around the lower part of the abdomen, particularly at the sides. This is something else that the gorillas exhibited, again my photos didn’t do it justice but here is another example. I noted how fake the gorilla’s feet looked. I was unable to take flash photos as it would have agitated the animals, and since there was only a very thin looking piece of plexiglass between them and me, I didn’t want to do that. It is an un-nerving experience to be eye to eye with these creatures, goodness only knows what it must be like to come face to face with an eight foot tall, more man – like version in the wild, without benefit of plexiglass, inadequate though it may have seemed! But note how the sole of the foot looks like a rubber pad glued on to the hairy leg. Which brings me to the track casts. As my regular readers will know, I recently purchased track casts that are said to have been made by Patty. Looking at photos of the casts is no substitute for looking at the real casts. There is no way for me to match the casts to the shape of the foot in the video, due to the bleached look and lack of detail in the film. **Update: I have, however, been able to match my copy cast to a photo in Christopher Murphy’s book. The book shows a little crease in the mid tarsal break area. My copy cast has the same crease. I am satisfied the cast is from that print. Since we were near the coast at the time we decided to go to the beach after having been to the zoo. The tide was out some way and there were three distinctive bands of sand leading to the water. The first band was the very dry sand that was easy to leave a print in. Not of the depth apparent in the patty casts, but certainly a noticeable print. 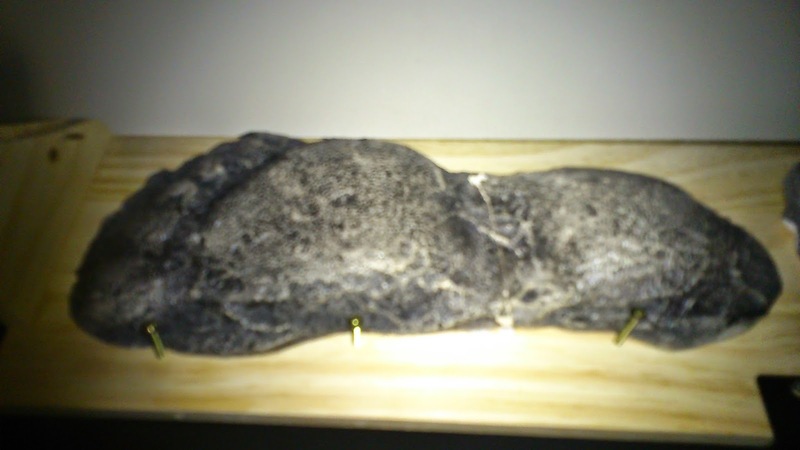 The one thing that did strike me was that my footprint exhibited a feature similar to the apparent “mid tarsal break” in the Patty casts. Where the heel and toes are much deeper that the mid foot. I had thought this feature was of great significance in the Bigfoot casts which showed they were made by a real creature rather than a foot shaped plank of wood, but that the feature was also not a human one? This has puzzled me somewhat and perhaps I need to research the distinction between a mid tarsal break and an arch. I moved on to the wetter sand further down the beach, which I though would yield a great print but it was in fact extremely difficult to make any impression at all since the sand was so dense. I had to really press down hard to leave this print. Then I moved on to the very wet sand right at the edge of the water. It was easy to leave a print but that print vanished almost immediately as the wet sand oozed back into shape like some kind of memory foam. The problem with questions about the substrate are complicated by the fact that the creek flooded several times since the 1967 filming event, and that potentially can bring a whole change of substrate down the creek to wash away what was there in 1967 and replace it with another substrate from up river. So in the years after the filming, examinations of the substrate cannot be assured to have been the same as it was in 1967. There may be some descriptions in some of the early texts about the event, by Green, Dahinden, Byrne, etc. who wrote about the event, which may contain descriptions of the substrate. I visited the site in 2012, but the erosion of the creek-bed was sufficient that I could not make any appraisal of what kind of substrate was there in 1967 from my visit. Regret that I cannot help you further with this question. I’m glad Bill took the time to respond and his reply makes a lot of sense. Unfortunately it adds one more variable to the conundrum. 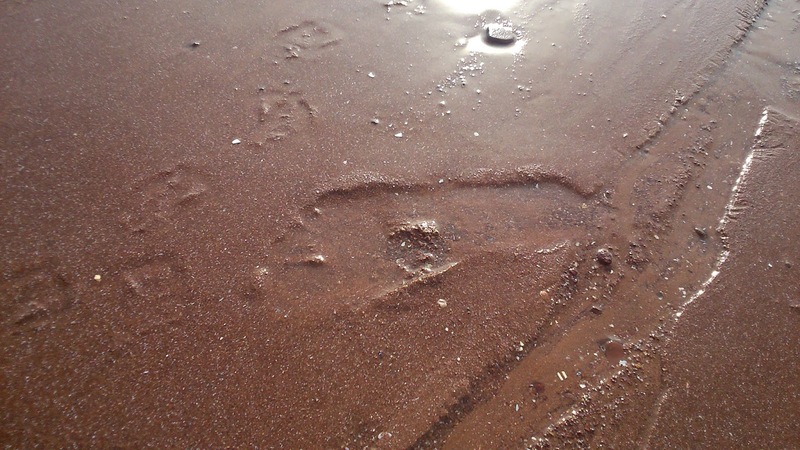 Whilst it is pretty evident that the track was made by a big animal with a human like foot, it is impossible to know what kind of surface the animal was walking on. 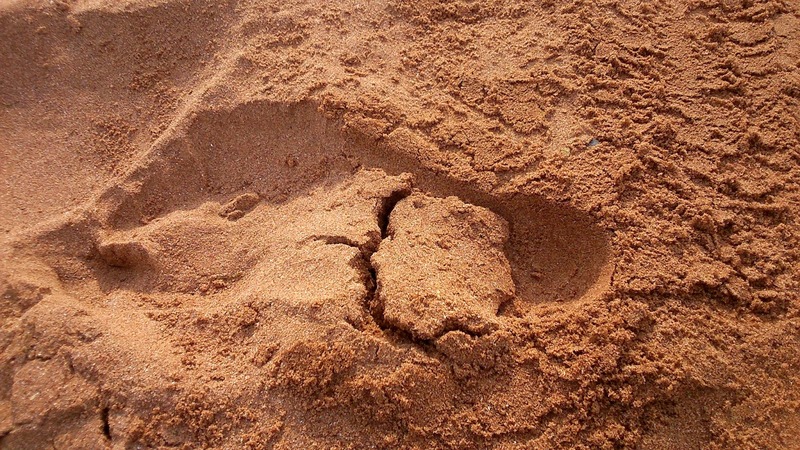 Was it dry sand, damp sand, wet sand, or was it not even sand at all? How heavy did the animal have to be to leave a track of approximately 2 inches (compared to the half inch deep track I left in dry sand) ? This makes me think it was more like this sandy surface, but probably denser and therefore even harder to leave a decent print in, unless you have a lot of weight behind it. The tracks remain an impressive and compelling piece of evidence though. I have asked the curator of mammals at Paignton zoo to take a look at the tracks and give me his opinion. As yet he has not responded to my email… maybe he’s a busy chap or maybe he’s joined the growing number of professionals I have contacted about the subject who think the subject is a big joke. **Update: The chap from the zoo replied to let me know that he thinks the tracks are fake and that apparently, the book I had purchased at the zoo which contained a section on Bigfoot was now sold out, which in his opinion was probably for the best. He clearly thinks it is all hokum. He states that if there were such a creature roaming around America, then David Attenborough would have found it by now. **Update: I have an interested party at Liverpool University who seems willing to at least take a look at the casts. I have contacted three other specialists who have either not replied, or declined the invitation to view the casts. The sand on the sandbar itself above the eroded creekbed is a fine clay silt. It is this that was deposited by the massive 1964 flood. There is no indication that this was washed over by later much smaller flooding events. We took Munns to the site in 2012, and I'm surprised he didn't notice this fact. Conditions at the point of that track being made were probably mostly dry and soft, with a sight bit of moisture retained. Such conditions are observable today simply by brushing away the top layer of current forest duff and debris. I was grateful for Bill's response, which does state: "potentially can bring a whole change of substrate ". I think the word "potentially" is important in the response. To actually get a response from someone is quite refreshing since most people I have contacted with my questions have not bothered to do so. It is a frustrating thing for me since I am not able to just drop by Bluff Creek to see what it is like I have to rely on boks and websites to find out all I can about the film site. I do hope to get over there some day and visit the site. I think it is an important step for anyone seriously trying to weight up the film's validity to make the effort to actually go there rather than just read about it. Since obtaining the casts I have really been trying to focus on the mechanics of how the original footprint was made, what kind of foot made it, how much weight would be required to make such a print etc. That's what got me thinking about the substrate. How can I assess the weight required to make a deep print if I don't know how dense the surface was? As I say, very frustrating! But incredibly interesting. Come on by. We'll take you out there. Bill was standing not thirty yards from me as I showed this sand to Daniel Perez by just sticking my hand into the ground where we ate lunch. It's 1964 flood silt and nothing else. Gonna take some serious funds but its on my agenda, definitely! So is it fairly easy to make a deep impression then? This is fine powdered silt sand from the great 1964 Flood. Well, you know, the sands have compressed with time. 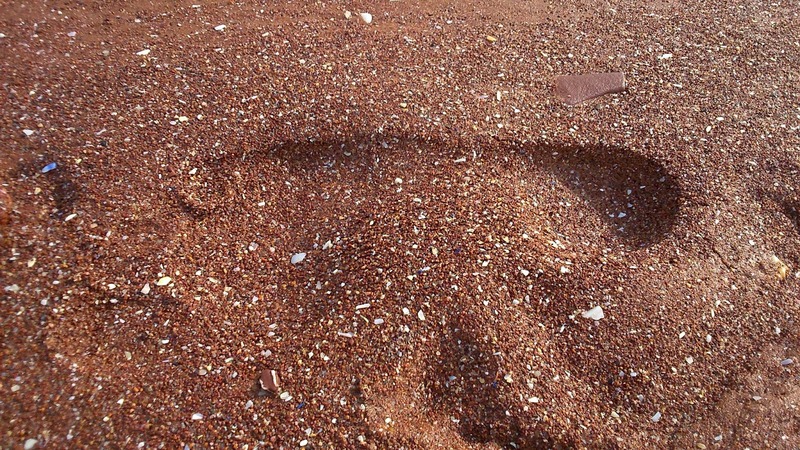 Just under the surface is a very fine and malleable sand of such fine grain that it's basically a powder. Perhaps I could post a photo of it on the Facebook group. I have several small jars of the stuff from different parts of the trackway.